I’m sure when the experts warn us of the negative health implications of skipping breakfast they’re not necessarily referring to our beloved ‘Full English’. Yet even those in the know would surely face a dilemma when confronted with the prospect of having to fork out up to £30 for a hotel breakfast – the kind of price that could well leave you choking on even the best locally-sourced sausage. It’s no wonder then that Lastminute.com has revealed that ‘breakfasts charged at an extra rate’ is the number one guest gripe amongst over 2,000 adults who were surveyed – and that’s before we even consider what that actual rate is. The report also revealed other popular guest gripes when it comes to hotel extras, including Mini-bar prices, single room supplements and the cost of Wi-Fi. The average breakfast cost came in at £12.60, based on research from over 54 four-star and 10 London five-star hotels. Whilst you might expect the prices to be a little higher in these higher-rated hotels, in my experience even lower-graded hotels can charge a princely sum too. Here at Which? Travel we’ve been doing our own investigative work for an upcoming article and have also been astonished by the high price some hotels charge for breakfast – can it ever really be so good? As a travel researcher I’ve had my fair share of good and bad cooked breakfasts. The good usually involves eating fresh, locally-sourced produce, brought to my table with outstanding service to match. The bad typically follows the pattern of queuing to be seated, queuing for food and finally trying to guess the pork content of your rather anaemic looking sausage. 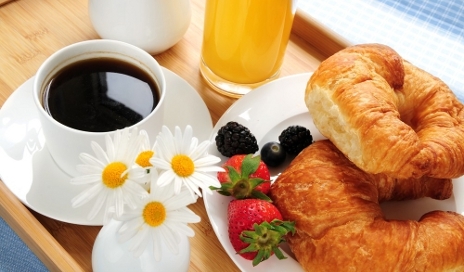 Whether it’s laziness or lack of time, many of us don’t have any option than to eat breakfast in our hotels. Perhaps if they were all good, hotels could justify the price. But, in my experience, the cost doesn’t always bear relevance to the quality of the food – some of my most expensive breakfasts have also been the worst. I recall one particular example in a large four-star hotel where, after queuing for over 20 minutes for a table then queuing for our food, we returned to our table only to find another couple being shown to our seats. We gave up waiting for our requested knives to arrive, resorting to spreading jam onto our toast with a tea-spoon (admittedly this was a lot easier than you might think). Let’s just say I won’t be rushing back. When I have to start work at 8.30am hotels only starting to ‘think’ about serving breakfast at 8am is no use whatsoever. I use the word ‘think’ judicially as frequently 8am start means there might be a member of staff kicking around but chef certainly hasn’t got any cooked breakfast ready – and that also includes toast! Some of us do have to work weekends and are not just on a relaxing holiday! Hotels in London are the biggest rip-off anywhere and, bar a possible few at the very top end, are miles behind their regional counterparts in terms of quality and experience who seem to have moved with the times. As for breakfasts I suspect most hotels catering for businesses feel they can charge what they like as most employees will just claim it on expenses and who bothers to check (although at my place I have challenged why we use such an expensive company for bookings when it’s quicker and cheaper to use online services for nothing – the response being ‘coz we’ve always done it like that’ – and we wonder why, as a nation, with mentality like that, we’re in a recession… anyway, corporate rant over). For personal travel we tend to go with hotels that include breakfast – these tend to be smaller, boutique style hotels where the breakfasts tend to be enough that you don’t feel like eating anything else until evening anyway. Where breakfast isn’t included, and depending on the quality of the establishment or the location, we try and seek out a nice cafe that may have a bit of an atmosphere – these tend to offer much better value and quality. We have paid for a breakfast with online bookings and never received the breakfast because we had to catch an early flight. Having said that if you want a rip off price try an airport breakfast. Certainly in UK towns and cities, if the hotel breakfast is extra and overpriced, I’ll pop out to a cafe or even some pub chains. The welcome is always more friendly and value vastly better. Beats a lukewarm buffet, slowly congealing, any day. Breakfast at a reduced price, £9.95 per head. Only thing edible were the beans and toast. But the coffee was excellent, I would have gladly paid £5 for the 3 cups I had. Motto, when booking a hotel do a little extra work and find where the nearest cafes are, twice the breakfast at half the price.